Ytterst Mot Norden is a choral work built from 32 layers of the artists’ own voices, originally comissioned during the TW2 residency for Tou Scene, Stavanger, Norway. A song was selected by the artists, who cannot read or speak Norwegian, from a book of old Norse folk songs found in a Stavanger charity shop. Their performance of the song begins with one voice that sings with uncertainty and stumbles over notes and pronunciations. As other voices join in and repeat the refrain, mistakes are in some places reinforced, in others ironed out, until a strong and coherent chorus can be heard. The evolution of the song echoes the evolution of a culture, in which deviations become mainstream, or are otherwise suppressed. 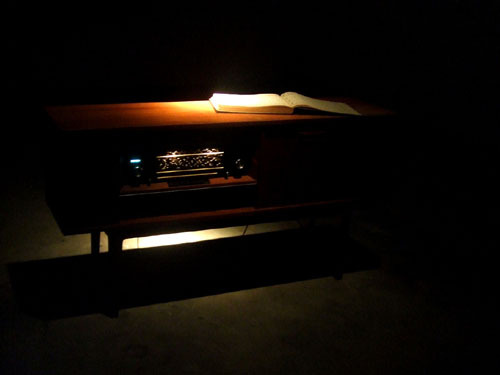 The work is cut into 12” vinyl record, and presented through an old sideboard entertainment centre, the outdated and outmoded devices creating a tension with this new “interpretation” of an old song. As well as an edition of 3 signed records, there is also a small edition of vinyl records that have been anonymously distributed to second hand shops in the area surrounding Tou Scene.